This question has been parading itself on Facebook for a while now like the madman in Achebe's The Madman, looking for whom would do justice to it. Here is what I've got to say. The statement, "A mother beat up her daughter because she was drunk" is a clear case of ambiguity. In English, ambiguity is a situation where a sentence can be interpreted in more than one way. Ambiguous expressions, either caused by a phrase or a word/lexical item, are always difficult to be given precise meanings. In lexical ambiguity, a word, usually a polysemous word, will make a sentence to have more than one meaning. For example, the word, "grace" in the sentence, "Everyone needs grace to make it in life". This sentence is ambiguous, (that is, it can be interpreted in more than one way) because of the presence of the polysemous word, "grace". Is it that everyone needs grace (as a person) to make it in life, or we need the grace (of God) to make it in life? These are two possible questions that will marry the mind of a reader who comes across such sentence, and this will inarguably leave a reader in a state of confusion while trying to ascertain the intended meaning of a writer. Structural ambiguity occurs when a phrase makes a sentence to have more than one possible meaning. For example, the phrase, "the shooting of the robbers", in the sentence, "The shooting of the robbers came as a shock", makes the sentence ambiguous. Is it that the shooting (operation) which was done by the robbers came as a shock, or the act of shooting the robbers came as a shock? These are two possible ways one can interpret the sentence. The question is, "who was drunk?". The truth of the matter is that no one can precisely state or tell who was drunk between them because the sentence is assigned with more than one interpretation. The ambiguity of this sentence is caused by the lexical item, she, which is a pronoun. The speaker or writer (of the sentence) assigned two antecedents, "a mother" and "her daughter", to the pronoun, "she", without clearly stating which of the antecedents the pronoun is referring to, thereby making it difficult for the listener or reader to give a precise interpretation to the sentence. So, while some would say that it was the mother who was drunk, others would argue that it was the daughter who was drunk. We don't need to blame them for the different interpretations because the sentence does not carry a precise meaning. However, only the speaker or writer of such sentence can state/give its actual meaning although that doesn't disambiguate the sentence. But what happens in a case like this where the speaker is unknown or can't be found to give the actual interpretation of the sentence? In a case like this, one will only resort to disambiguating the sentence in order to get a precise meaning. To disambiguate means to give a precise or one interpretation to a sentence or construction which can be interpreted in more than one way. The question now is, "how can one disambiguate or give a precise interpretation to our sentence of study?" HOW TO DISAMBIGUATE THE SENTENCE, "A MOTHER BEAT UP HER DAUGHTER BECAUSE SHE WAS DRUNK." "A mother beat up her daughter because the daughter was drunk." "A mother beat up her daughter because she, the mother, was drunk". "A mother beat up her daughter because the latter was drunk. (In this case, it is her daughter who was drunk). In sum, ambiguous sentences make it difficult for a reader or listener to understand a speaker's intent. Therefore, for easy comprehension of a statement, a speaker should avoid using ambiguous sentences. Tammy you are really doing a great job here... Keep up the good work man. I was just googling about some English articles and I found this blog. It's a great blog with a good design. A lot of work has been put in place. Well Done. Thanks, Charles! I'm glad you love what's happening here. thanks now I understand better. Drunk mother beats up daughter. Mother beats up drunk daughter. So my answer is that unless the mother is totally nuts, it's the daughter. I often say that English is hard so we should try 123. The statement as ambiguous and incomplete. If it was a full text, you would understand who 'she' refers to. Without a previous comment or a further explanation, we only have one piece and you cant solve a puzzle when u dont have all the pieces. I think personal pronouns refer to the last used pronoun as a rule of thumb. So it is the daughter who was drunk. This has really been helpful. Thanks. 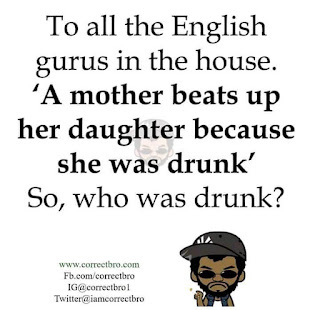 It is the mother that was drunk referring to the first pronounce 'A Mother' so the idea of beating her daughter came over her because she(mother) was drunk. Thank you, Ibrahim Opeyemi. You will never regret it. Always visit. Oh dear, so much violence in this. Beating people up is not my cup of tea at all. Whoever is beating anyone up really ought to calm down. MY dear I think you you're saying a different thing entirely, because all we need is to know who was drunk and not the other way, and i think I agree with the first write, because the pronoun "She" doesn’t specify either the mother nor the daughter was drunk. Looking at it technically, a drunk person is supposed to be in a sober state where they are weak. Therefore, depending on the age of the daughter, the mother cannot beat up her daughter in a drunken mood. So, it was the daughter that was drunk. Secondly, the mother cannot beat her daughter because she (the mother) was drunk. Was the daughter the cause of her drunkenness? So, you see again why it was the daughter that was drunk and not the mother. In the statement making rounds on the internet, the word is 'beats' and not 'beat' as you analysed. From my own understanding the statement is therefore not ambiguous as you interpreted it to be. In this context it is the mother who is drunk. It is refering to why a mother would in any case beat up her daughter. 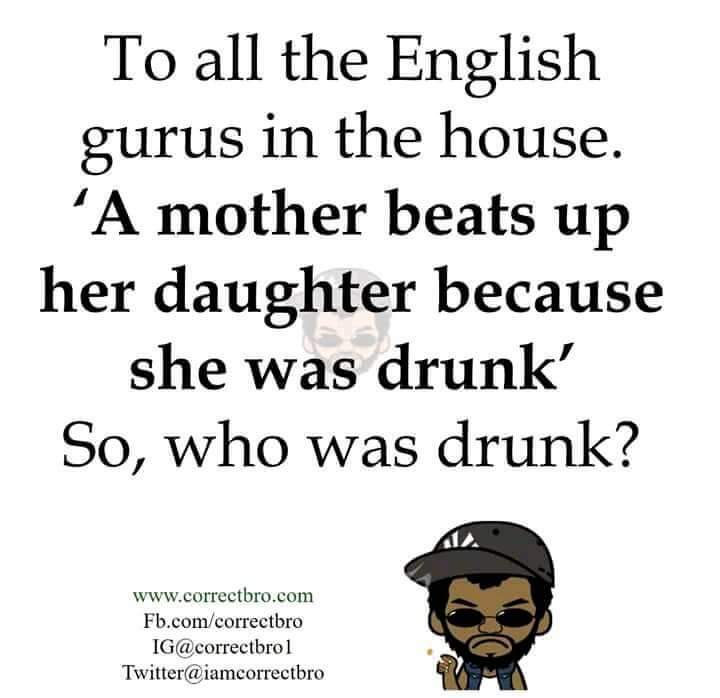 Even though the statement is wrong (a mother could beat up her daughter for many reason and not just the one stated), the person being referred ro as 'drunk' is the mother.